We went to Portland for a long weekend, and you can't go to the Rose City without a trip to Powell's. 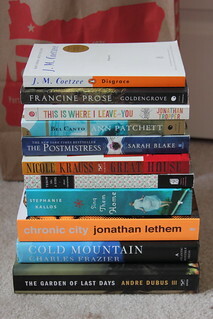 And I can't go to Powell's without buying a metric ton of books to read. This should hold me over for a week or two. We also hit the Oregon Zoo whilst we were there, and I shot roughly a bajillion photos with my new fancy camera because: a). I love taking pictures of adorable animals; and b). I haven't really had a chance to try out all the fancy features of my camera. True, I still don't know how to use many of the fancy features of said camera, but now I've got pictures of a polar bear to make up for it.